I am excited for this deal...I have been eyeing this for quite some time. It will cut my baking in 1/2! Amazon has Wilton 2105-6746 Perfect Result Mega 48-Cup Mini Muffin Pan, 15 x 21-inch on sale for $14.51 (reg. $20.99). 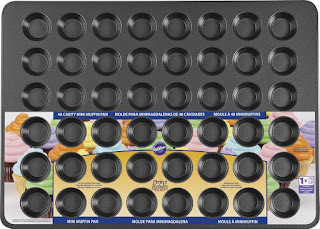 This package contains one 15-3/8 x 21-3/8×3/4 inch mega mini muffin pan with forty-eight cavities 2 inches round.